The holiday season is here and you’re sure to catch the spirit of the season when you visit the annual New Braunfels Wassailfest held the first Thursday of December. Stroll through the beautifully decorated and glowing streets of downtown New Braunfels sipping warm wassail and shopping local merchants for the perfect holiday gifts. The 2018 Wassailfest will be held on December 6th from 6:00-9:00 p.m. and features food, shopping, wassail sampling, and entertainment. Wassailfest New Braunfels began ten years ago as a festival to help residents and visitors capture the holiday spirit. Each year, downtown New Braunfels’ merchants open their doors at the start of the holiday season to offer wassail and treats to spread the holiday cheer. 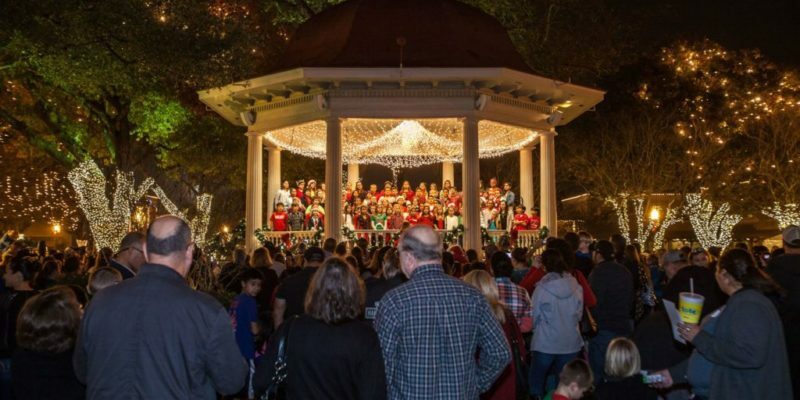 While you stroll the streets and Plaza aglow with 100,000 lights, you’ll also enjoy entertainment at every turn as talented musical groups perform throughout the downtown area singing, playing, harmonizing on street corners and inside establishments. At the close of the evening, Wassailfest goers meet and greet at the Plaza bandstand to enjoy the door prize drawings and more merry making until the bells of the New Braunfels Courthouse ring calling the evening’s festivities to a close. This joyous occasion is fun for the entire family and sure to be a memorable event you’ll want to attend year after year. The wassail tradition began as Medieval Christmastide English drinking ritual of hot mulled punch (fruit juice or cider) with sugar, cinnamon, ginger and nutmeg intended to ensure a good cider apple harvest the following year. The juice and spice mixture is typically served in great bowls or mugs turned from wood, pottery or tin and you’ll find uniquely crafted wassail mugs for purchase at various merchants during the event. The name wassail literally means “to your health,” a perfect toast to the spirit of the season. There is even a centuries old Christmas carol, “Here We Go A-Wassailing,” that you’re likely to hear being sung as you enjoy the evening festivities at New Braunfels Wassailfest. New Braunfels new master planned community, Veramendi, is the perfect place to toast to your health during the holiday season and year-round. This thoughtfully designed community is truly the start of something amazing, featuring an outstanding location minutes from downtown, endless amenities, and high-quality homes constructed with you in mind every step of the way. Contact us today to schedule a tour and find the ideal builder for your new Veramendi home!